Modernism Week has added many new events to the schedule for its signature festival that will take place February 14-24, 2019. The festival highlights midcentury modern architecture, art, interior and landscape design, and vintage culture in the Palm Springs area of Southern California. Now in its fourteenth year, the annual 11-day festival will feature more than 400 events, including the newly added parties at the Sinatra Estate, the Hidden Cody Tennis Club Villas tour, the Desert One Iconic Home Tour, the ‘Kaptur the Moment!’ Architecture and Design Council Cocktail Party, and many new talks. on December 1. Additional events will be added in the next few weeks. Thirteen lovely homes built in the mid-1960s are nestled next to the historic Palm Springs Tennis Club. Brilliantly designed by William F. Cody, the original homes include a model home decorated by the preeminent interior designer Arthur Elrod. Each of the homes has been fabulously renovated, including one home that was recently featured in Palm Springs Life magazine. Desert One, designed by San Francisco-based architect Jim Jennings in 2009, is reminiscent of the ‘Case Study’ houses dating back to the midcentury. The unique residence gives new definition to indoor-outdoor living, inverting the idea of 1950s post-and-beam architecture, which was about openness as an extension of the surrounding landscape. The 1960 Morse Residence was originally designed as an Alexander tract home by Palmer and Krisel and in 1961 was purchased by Theodore and Claire Morse to create one of the best-known entertaining/party houses in the Vista Las Palmas neighborhood of Palm Springs. This Iconic Home Tour enables attendees to experience the home’s sunken living room with white natural rock walls, a dazzling adjacent bar with pocket windows that open, and the most amazing swimming pool. Modernist architect Hugh M. Kaptur's custom-designed 1979 residence for Al & Lois Anderson is currently undergoing a major rehabilitation. This gritty “hard-hat” tour is a unique opportunity for attendees to get a behind-the-scenes look at a major restoration and reimagining of the house done in consultation with the original architect. Atomic Ranch is celebrating the legacy and future of modernism through a special presentation featuring a panel of trusted experts. This thought-provoking discussion will be moderated by real estate specialist TJ Pierce on the preservation, impact and long-term importance of Midcentury Modern architecture. John Jordan and Will Bodine, authors of Looking Backwards, America’s Love Affair with the Station Wagon, will offer a lively presentation on the midcentury station wagon, an American classic. KCRW's Frances Anderton will moderate a discussion of the first-ever expansion of New York’s Kennedy Center for the Performing Arts. The project’s lead architect, Chris McVoy, and landscape architect, Edmund Hollinger, will unveil REACH, which together with the original building, will form a unified campus that will be the premier nexus of arts, learning and culture. Cultural archeologist Martin McGee will discuss how envisioning the future, the exuberance of the times and the all-pervasive Space Race all melded together to influence the prescient design aesthetic in the Space Age era. Join Australian interior designer and design educator Annalisa Capurro (a.k.a. Ms. Modernism) to hear the story of ground-breaking Australian midcentury designer and businesswoman Marion Hall Best, who went on to become one of Australia’s first and most influential interior designers. Credited with creating some of the most spectacular and decadent midcentury spaces in Australia, Best’s legacy is still largely unknown internationally. Shag’s Architectural Print Party with The Martini Kings Playing Live! Iconic artist Josh Agle (a.k.a. Shag) will host two free cocktail parties at his shop in the Uptown Design District to highlight many of Shag’s previously sold-out architectural prints. This party will feature live music by The Martini Kings and complimentary cocktails. Join other Midcentury Modern and Shag fanatics as we all enjoy stimulating conversation, fun retro outfits, and colorful SHAG architectural artworks and other fun merchandise. Party poolside at this incredible idea house created to inspire and guide architecture and design enthusiasts when it comes to the art of modernizing a midcentury home for the way we live today. The Mid Mod Cocktail Party benefits the P.S. Cares public safety program of Volunteer Palm Springs. Frank Sinatra’s stunning 1947 residence designed by Desert Modernist architect E. Stewart Williams will be the backdrop for a magnificent soiree where the tastes, sounds and sights will take guests back to midcentury Palm Springs. This special evening is produced by Modernism Week and generously supported by Ferguson Bath, Kitchen & Lighting Gallery and JennAir. 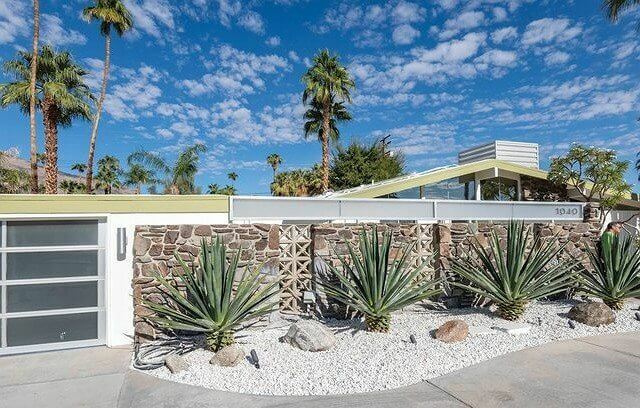 Palm Springs Art Museum Architecture and Design Council will celebrate the work of architect Hugh Kaptur with an event that enables attendees to tour Kaptur-designed homes, dance in the streets, and enjoy heavy hors d’oeuvres and an open bar. The Saguaro Hotel will host a screening of 2001's 'The Anniversary Party', shot entirely in and around Richard Neutra's 1951 Schaarman House, located in the hills of Hollywood. It will be accompanied by a display of the publication “Sad People in Modernist Homes in Popular Films.” This book explores the occasional tendency towards housing unhappiness and melancholy inside of some of the most beloved vernacular architecture. Copies of the book will be for sale, and plentiful popcorn will accompany the screening. This documentary film by Leo Zahn explores Frank Sinatra’s deep attachment to Palm Springs and the Coachella Valley, his home for almost 50 years. The film captures the spirit of the Sinatra era and pays tribute to the unique lifestyle of Sinatra’s Palm Springs and Rancho Mirage. After both screenings, attendees have the option to attend a VIP meet and greet with the director and enjoy a hosted bar and heavy hors d’oeuvres, view bonus footage and ask the director questions. Enjoy a morning of midcentury cinema at the Rancho Mirage Library and Observatory. Cultural archeologist Martin McGee will present ‘Marooned,’ a 1969 film starring Gregory Peck and Gene Hackman. Three astronauts face a desperate situation in this spellbinding science fiction cliffhanger that won the Academy Award for Best Special Effects in 1970. Rated G.
Modernism Week’s popular Vintage Trailer Show – one of the most celebrated and exciting events of the second weekend – returns this year and promises to be bigger and better than ever. This thoughtfully curated collection of vintage trailers, campers, buses and motor homes is arguably one of the largest and most attended vintage trailer shows in the United States. The show will also have a fun mix of retail vendors whose products complement the vintage trailer lifestyle. Eric Trine of Amigo Modern, the Long Beach-based contemporary furniture designer best known for his geometric furnishings, will present a fun Pool Noodle Workshop that will be an exercise in exploration, play, pushing materials, and seeing how far you can go – and then how far you can go together. Norma is a Los Angeles-based design endeavor that creates objects, furniture, and interiors. The studio is best-known for its modular shelving/seating systems and Pools print series. Prizing modernism's material candor and distillation of form, Norma continued its exploration of Southern California's bathing culture by collaborating with the Saguaro Hotel to create a limited-edition print of the signature Saguaro pool. Produced by Modern Bear and hosted by H3K Home, this annual sale has become one of Modernism Week’s most popular free events. Carefully curated vendors offer their highly coveted mix of vintage Mid-century decorative furnishings, fashion, and collectibles. Free donuts will be provided by the Paul Kaplan Group and coffee by Koffi. Modernism Week’s signature 11-day festival will take place February 14 – 24, 2019. To receive updates, visit modernismweek.com and sign up for Modernism Weekly, or follow them on Facebook, Instagram and Twitter. The Hilton Palm Springs Resort, Modernism Week’s official host hotel, is offering a special room rate for a limited time only. Contact them directly at 760-320-6868.